When we moved to this property there was a canopy of secondary growth shagbark hickories, oaks, a Slippery Elm and a few hackberries all growing in a weedy lawn. Other than a diseased redbud and a lovely Ostry virginiana that was being smothered by a white wisteria vine there was absolutely no understory. Hamamelis virginiana is a small multi-stemmed slow to moderate growing deciduous tree or large shrub with arching branches and fragrant yellow flowers that bloom in October and November. It's native to eastern North American, including Louisiana and Texas. That was many years ago and it's still one of my favorites. It's growing in a small woodland garden beneath the swaying branches of a shagbark hickory and The Dancing Tree, the little Ostrya virginiana that I rescued from the strangling wisteria. It's perfect for woodland gardens and generously shares the ground beneath with woodland favorites like Christmas ferns, wild ginger, phacelia, trilliums, Dutchman's Breeches and other spring ephemerals. It's a darn shame that it is overlooked by most nurseries in favor of the flashier non-native witchhazels. Perhaps, the problem is that the flowers aren't as large and can be missed in a landscape filled with glowing autumn leaves. But, there's so much to be seen when you take a close look at its bloom. I might have missed the nectaring bee mimic/hover fly had I not climbed into the woodland bed to look into the pretty flower face. If you don't take a close look you'll miss seeing the marvelous seed capsules. They explode when mature, sending the seeds more than 20 feet away from the parent tree to ensure the seed's best chance for germination. You certainly don't want to miss their delightful, fragrant spidery crepe paper flowers that never fail to charm as they furl on cold days and unfurl on warm ones! You can't go wrong with a Hamamelis virginiana. I've loved this plant since I first saw it and my affection has never wavered. Yours won't either if you decide to add it to your garden. It's a holiday this week and company is arriving at my house on Tuesday, so I am posting Wildflower Wednesday on Monday and it will be up all week. Feel free to join in at any time. I just read your marvelous and thorough post on the native witchhazel. Mine bloomed beautifully this year and while I did plant the cultivar, it reverted to the native root stock. I have to say, I am not disappointed! 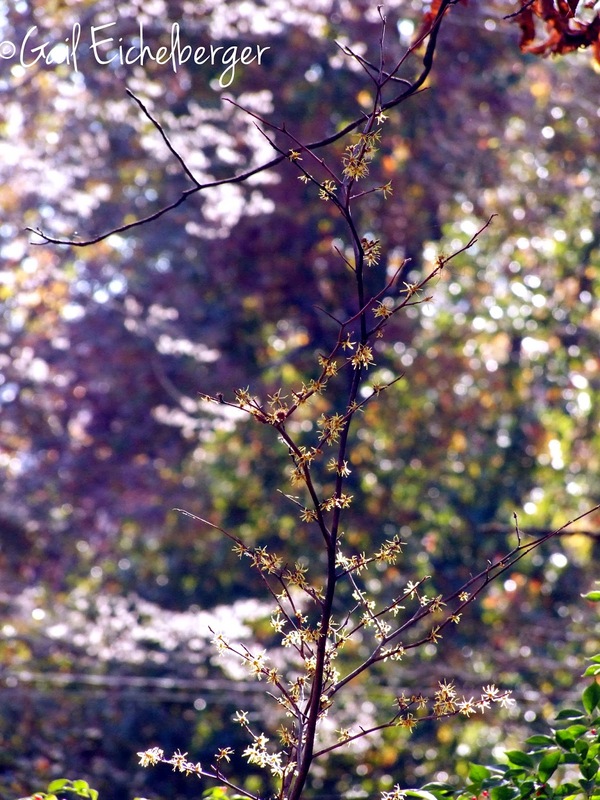 I agree, the native should be more available as it is the last tree/shrub to bloom in my New England garden. I first saw this tree on your blog and added one to my garden. it is still small and has not flowered but I am hopeful for next fall. Here is another small tree I need to add to my garden. I will surely find a little spot for it! Aren't tough, adaptable trees--and people--wonderful? They make the best friends. Still waiting on buds, seed pods and blooms on my two! One is over 3 yrs old...the other, a year. When will it happen?! Cannot stand the waiting...but sure like yours! Such a lovely little tree ... I'd love to have it but I suspect my particular microclimate isn't hospitable. Gail, your photos are gorgeous! I added a native witch hazel last year but haven't seen any blooms yet this year. It seemed that mine was blooming more in December--we have some odd little microclimates in our garden. Now, I want to add many more--I didn't realize how well it would thrive as an understory tree. Thanks for the inspiration! Enjoy your company, and wishing you a very Happy Thanksgiving! I love witch hazel and your photos are terrific. I'm sorry our local hospital sees fit to prune their witch hazels into little lollipops. I adore Witch Hazels...they are amazing 4-season plants. And look at the blue sky behind those spidery yellow flowers. Lovely eye candy. I have a very small Hamemelis virginiana that is about 3' tall. I thought the rabbits killed it the first winter but it bounced back. Hope it makes it to maturity in the not too distant future. It's like you're describing my garden as the perfect place for Witch Hazel--Oaks and Hickories, shade. We don't have any in our garden or woods, but I'm thinking it would be a good replacement for other shrubs when they pass on. Late bloomers and understory trees are just what I need in my garden. Will have to look for this pretty native with the spidery flowers. I've always loved your witch hazels, Gail. The seed pods are so cool, too, another example of Nature knowing just what is best to keep the cycle going. Hi Gail, thanks again for hosting this. I've always liked the witch hazels from blog posts, they always look so extra ordinary. Am glad you put a wide angle shot of the whole plant to see the size of the flowers and the bald stems. blues and purples as I make an Advent wreath of garden flowers. Hamamelis virginiana is native to you but very exotic here. It is beautiful. I grow Hamamelis x intermedia 'Pallida' and it is a highlight of the winter. I love your blog; it is fascinating to see what plants are native with you and how you grow them. In my last job, I always tried to keep H. virginiana in stock. There was one place in Iowa that sold them (and lots of other under-appreciated natives) bare-root. We would pot them up and grow them on for fall sales. It was never a crowd pleaser, but to the right people it was a good find. Great shots. You have a very beautiful place.